I finally bit on some digis from CS Designs. I love all the faces she does and she almost always has several faces and sentiments to go with them in a group. This is from, yes, you're right, The Mermaid Series. This is also a test for a spot on the Design Team at ATC Challenge Blog. Hope you girls like my work when you come over to visit. Would love a spot on the team. I wish you could see the sparkle with the Clear Star pen on the fish, her eye shadow, and on the star fish. 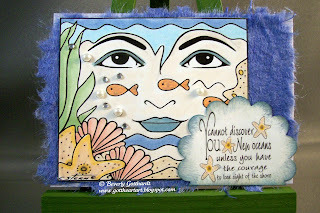 Supplies: Blue textured ATC-Marco's Papers, Papers: Marco's Papers-mulberry paper, Stampin Up-Whisper White card stock, Stamps: CS Designs-Mermaid digi and sentiment, Ink: Copic Markers-B00, B95, BG10, BG72, Y38, YR61, E21, YR02, E00, E000, RV42, G82, Sakura Gelly Roll Pen-Clear Star, Stampin Up-Crumb Cake, Bordering Blue, Stampin Up-1 3/4" Scallop Circle punch, The Paper Studio-pearls and gemstones. hi Beverly .Your ATC is beautiful .Love the layer paper base for your stunning image . 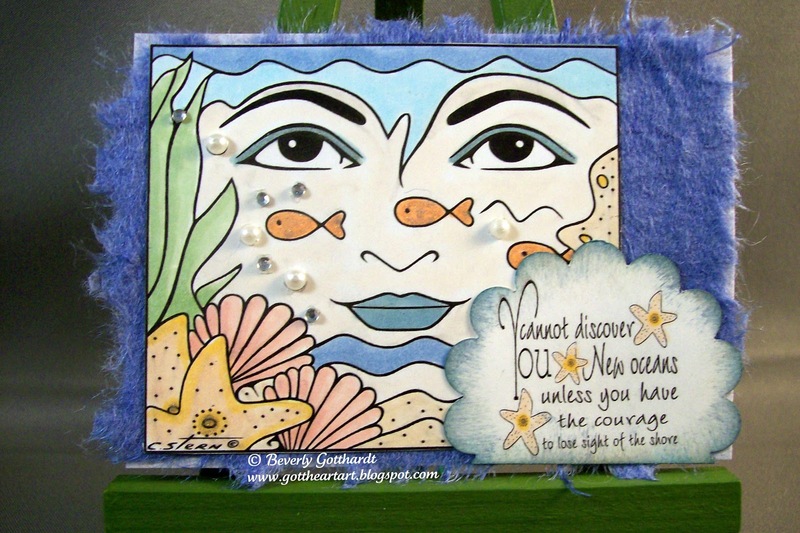 Thanks for sharing on ATC Challenge blog . This is an amazing ATC Beverly!!!! I love what you have done with this CS Design!!! Fantastic!! !